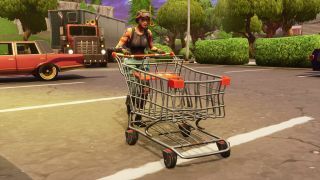 With Fortnite basically taking over the gaming industry one Battle Royale title at a time, it was inevitable that - at some point - we'd see Fortnite merch arrive. And boy has it. From tees and hoodies, to sweatshirts and PopSockets it's all here emblazoned with your favorite in-game items, sprays and more. Prepare your wallet, because we've selected the best Fortnite merch you need to check out, and probably wear for every match. First there were 100. Now there’s just you, flossing on the Victory Royale screen with the scattered remains of the second to last player’s loot around your feet like a pro. But did it really happen unless you’ve got the tee to prove it? Bask in the glow of that Victory Royale for months to come by getting yourself this battle tested tee that’s basically the prison wall scratchings of a Fortnite badass. You’re so good it’s basically criminal anyway. Here’s a llama, there’s a llama, there’s another little llama. That YouTube song from the ‘90s might not be so true to life when it comes to the real Fortnite llama locations, but when it comes to getting the colorful camelids on a sweatshirt, you get not one, but four of them. Just be prepared that other Fortnite players might try to whack you like a pinata if they see you wearing it. Even after all that malarkey with the screens and the meteors at the end of Fortnite season 3, Tilted Towers is still here and still absolute carnage. If you’re the kind of Fortnite player that doesn’t just hide and move very carefully with the storm, you might want to showcase your Tilted love for all to see. The graffiti style, the choice of text colour and tee will only serve to seal the deal. One of the more adorable and unusual sprays available in Fortnite is the Royal Stroll. The little majestic penguin has become a mascot of sorts for the GamesRadar Fortnite team, to the point we tend to spray it all over our towers just to make sure other players know we got them. Now it's on a sweatshirt, and yes, I've already bought it. And so should you. How can you deny yourself that cuteness? The Fortnite hungry gnomes might be the only ones who know what a Durr Burger actually tastes like, but we can dream, right? I’m imagining it like some hybrid dream burger that’s part In-n-Out and part Five Guys with just a hint of Shake Shack. But enough of burger lust, because the closest you’re going to get to dining out on a Durr Burger is going to be with this tee (at least for now, the Fortnite empire is only beginning after all). If you’re looking for some Fortnite merch that’s all about purity, then this tee might be one for you. Neon. Simple. Inherently Fortnite. The little llama has become synonymous with Fortnite, so what better way to pledge your allegiance to Epic and the Fortnite deities with a classic tee? What has that bush ever done to you to deserve a thorough pelleting with machine gun rounds? Oh, last round it shot you dead? Fair enough. Fortnite might be one of the only games to make inanimate plants aggressive tactics, but boy do they come in handy for a disguise or two. The shrubbery in question is now making its way from the map onto your chest thanks to this hoodie, albeit in its spray format. Just do what the hoodie suggests and do it, hit that buy button now. Forget about Thug Life - although those YouTube / Facebook videos are hilarious - when it comes to Fortnite, it’s all about Chug Life. Finding the legendary consumable known as the Chug Jug is quite the boon in a round, especially as it’ll grant you full health and full shield in a mere 15 seconds. But there’s a way to make sure you’ve always got a Chug Jug to hand, get this hoodie. You can’t technically drink it, but it looks snuggly enough to make you feel like you’ve downed an entire Chug Jug before every match. Imagine if you could play Fortnite on your phone, while using a Fortnite PopSocket. Well, now you can (although we know you’re still wondering when is Fortnite Mobile coming to Android). There's a whole line of Fortnite PopSockets now available, with designs ranging from the llamas and the battle bus to characters or just a simple logo. You phone deserves Fortnite merch too, after all. I still don’t know why anyone would leave this spray painted anywhere near their tower, unless it was part of some elaborate ruse, but to have it plastered across your hoodie seems like the best place to put it. After all, if you are the trap master, impaling other players all over the map like some colorful serial killer, then why not shout about it in outerwear form. Snug and sneaky.